You are a young entrepreneur running a bootstrapped startup. Capital is precious little and the number of employees fluctuates often. Since you are early-stage, landlords and commercial property-owners are wary of letting out space to you. And, even if they agree, the deposit they seek is logic-defying. Enter co-working spaces. Not only do they let you choose the number of seats, but facilities like high-speed internet, meeting rooms and teleconferencing equipment, among others, are available at a fraction of the cost. Sounds like a no-brainer, doesn't it? Little wonder then, startups, small businesses and freelancers alike have been flocking to co-working spaces, and names like Innov8, InstaOffice, 91springboard are looking to cash in on the opportunity. Many of these co-working spaces have, in fact, also been able to secure a significant amount of funding. "I think the demand has always been there but nobody actually addressed supply. This is a space [where] you'll see people scaling up nicely and substantially. Even if it is 5-6 players, it's alright. It's like the hotel industry—availability of good infrastructure drives demand," says angel investor Dheeraj Jain, who has backed Innov8 and branded workspace aggregator Qdesq. Business models Within the space, there are two models. First, the full-stack one, wherein a startup either leases or buys an office space, and takes care of the operations. "We sign a lease with the landlord, which could be for 9-15 years. The landlords furnish the space for us and we take care of the operations. Initially, we used to take property on rent and convert it into a co-working space," said Himanshu Bindal, founder, OneCo.Work. Though capital-intensive, this model allows the startup to control the quality of services and have a better grip on the margins. In the second model, a co-working startup converts spaces within cafes, restaurants, and other existing offices, etc. Cafes and restaurants are usually eager to sign up since most of them have weak footfall during off-peak times. For example, myHQ, which positions itself as 'Starbucks meets co-working space', takes up spaces in hotels, cafes, and food and beverage joints. Not only does it manage the Wi-Fi and other amenities, but it also incentivises the staff. Makaan co-founder Aditya Verma, who has launched a co-working space, had told VCCircle that most co-working spaces run as real estate businesses, wherein owners/developers convert vacant office space into co-working spaces, a model that is difficult to scale. Verma's startup, TheOfficePass, allows owners of commercial properties that are not yielding returns to plug their space into the platform and start earning. Utkarsh Kawatra, co-founder, myHQ, agrees: "If you look at the West, the co-working model became profitable only when it reached more than 20,000 sq ft space. But you won't have so much space in India, so there is no economy of scale." Kawatra believes that recouping the investment from a co-working space, which may require nearly Rs 1 crore to set up, is difficult in a price-sensitive market like India. He says that since myHQ is not looking to get rental output, there is no pressure to lock in a customer. However, not everyone is convinced with the myHQ model. "I would stick to professional co-working spaces, rather than going for cafes-turned-into-offices. I am not sure if a cafe gives that kind of professional environment," said Aditya Gupta, chairman of early-stage fund Quarizon. Occupancy rates Irrespective of the model, attaining a healthy occupancy level is imperative, which means co-working spaces need to diversify their client base in order to be sustainable. "Most co-working spaces are focusing on startups. And startups are very fickle occupant community—you never know how their business plan will shape up," says Paras Arora, founder of Qdesq. Arora added that these startups can fill up to 50-60% of the space by themselves, and aggregators can help them achieve breakeven and profitability. "Co-working spaces (considering real estate prices) need an occupancy rate of 70-75% to break even. The most they can reach is 90%, so they are basically playing on the 15% occupancy," he says. Aggregators usually make a margin of anywhere between 10% and 25%. Ritesh Malik, founder of Innov8, agrees that it's not wise for co-working spaces to put all their eggs in the startup basket. "Instead of just focusing on startups and freelancers, they can focus on SMEs, remote corporate teams, etc as well. This also ensures a diverse community experience." Innov8 claims to have 100% occupancy and a waitlist. Pranay Gupta, co-founder of co-working space 91springboard, claims they receive interest not only from young startups, but also Series-C funded players and listed companies, which ensures that occupancy levels are maintained. 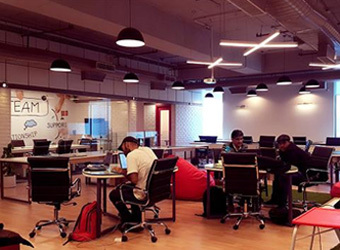 Cost-cutting at Indian unicorns and relatively more stable companies presents another revenue opportunity for co-working spaces. For example, last year e-tailer Snapdeal vacated a 200-seat office in Mumbai's Malad and chose a 90-seat co-working space in Andheri instead. Community-building "Entrepreneurship is lonely, and a co-working space gives you the opportunity to connect with other entrepreneurs and be part of a community. Community building is the secret sauce for a co-working space," says Quarizon's Gupta. Techies trying to get branding right for their venture, and a digital marketing agency in the next bay bailing them out. Or a content startup getting precious nuggets on design from a firm that specialises in user experience! Several co-working spaces have a lot of emphasis on creating an environment of synergies, where occupants help each other out with their expertise. "The culture should remain intact. The whole focus should be on the community. We do have an application process to ensure that people contribute to the community," says 91springboard's Gupta. 91springboard also runs an incubator, but Gupta believes that both co-working spaces and incubators go hand-in-hand—both help early-stage ventures grow on limited capital and network with others.